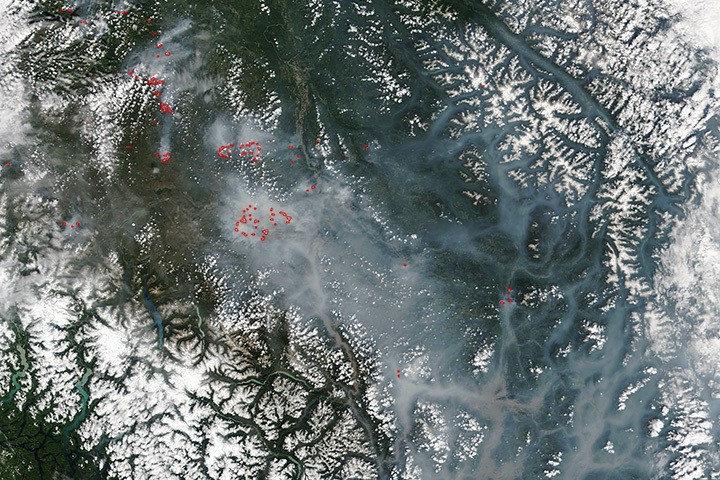 For more than a month, dozens of large fires have raged in British Columbia. Since early July 2017, wildfire has burned through coniferous forests stressed by heat, drought, and infestations of mountain pine beetles. In early August, another cluster of intense fires flared up in Northwest Territories when a cold front pushed through the region with powerful winds. The intense fires and persistent southerly winds have wafted extraordinary amounts of smoke north over Canada’s Northwest Territories and Yukon and Nunavut provinces. 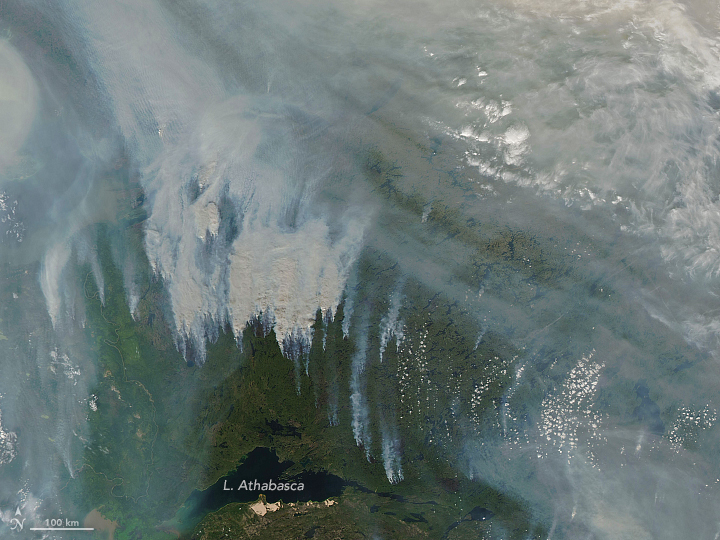 When the Visible Infrared Imaging Radiometer Suite (VIIRS) on Suomi NPP acquired the data for the image above on August 15, 2017, a heavy pall of smoke drifted over northern Canada. 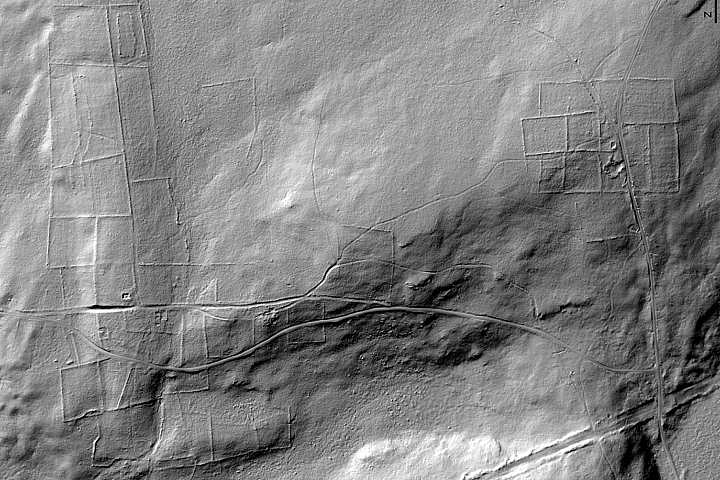 The image is a mosaic composed from several satellite overpasses because the affected area is so large. A more detailed view of the fires near Lake Athabasca (below), captured by the Aqua satellite on August 14, 2017, shows smoke streaming north. 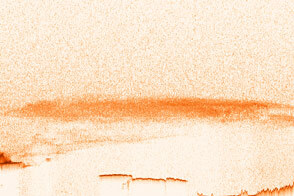 That smoke joined with another smoke band from fires in British Columbia. 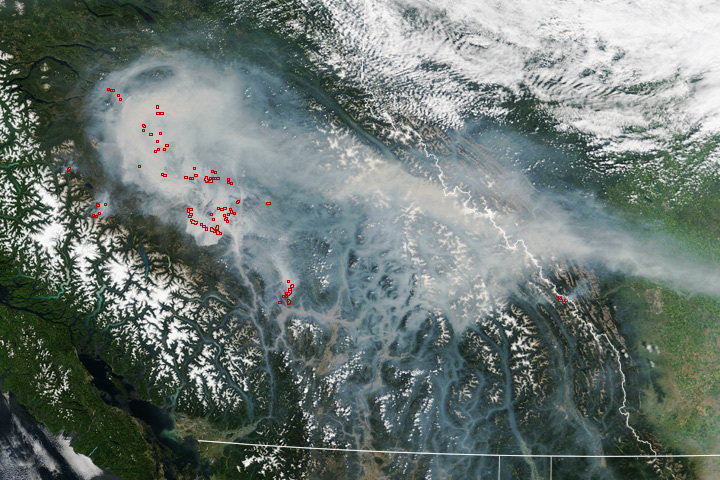 The fires in BC were so intense that they produced several pryocumulus clouds, lofting smoke up to 13 kilometers (8 miles) into the atmosphere. The resulting smoke plumes were thick enough and high enough in the atmosphere to break a record. According to Colin Seftor, an atmospheric researcher for NASA’s Goddard Space Flight Center, the Ozone Mapping and Profiler Suite (OMPS) on Suomi NPP recorded aerosol index (AI) values as high as 49.7 on August 15, 2017—more than 15 points higher than the previous record set in 2006 by fires in Australia. Maximum AI values also broke records on August 14 (49.4) and August 13 (39.9). Aerosols are solid or liquid particles (such as smoke, sea spray, and volcanic ash) that can prevent light from passing through the atmosphere. 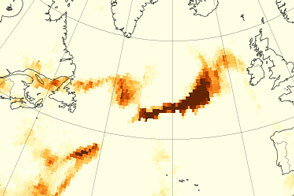 The satellite aerosol index was first reported in 1978 via measurements from Nimbus-7. 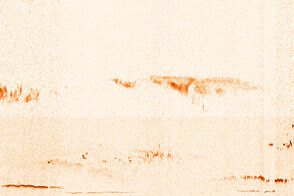 “The aerosol index is affected by both aerosol thickness and altitude,” said Seftor. “Values greater than 6 or 7 often reflect a pyrocumulus event, which can loft smoke high into the stratosphere, where winds can then transport it thousands of miles.” Other circumstances, such as smoke mixing with clouds, can contribute to high AI values. 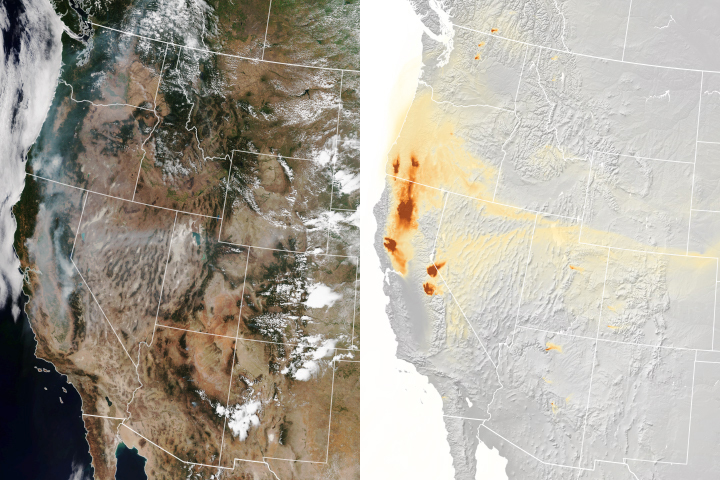 Scientists expect the smoky aerosols to linger. 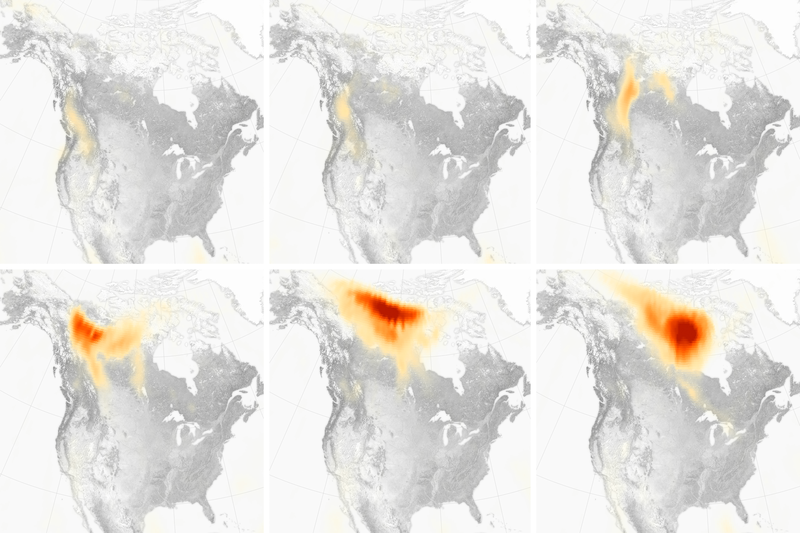 “Five-day forecasts from the Copernicus Atmosphere Monitoring Service show that large amounts of smoke are expected to extend into the high Arctic over the next few days,” said Mark Parrington of the European Centre for Medium-Range Weather Forecasts. NASA Earth Observatory images by Joshua Stevens, using Suomi NPP OMPS data provided courtesy of Colin Seftor (SSAI), with MODIS and VIIRS data from LANCE/EOSDIS Rapid Response. Story by Adam Voiland. 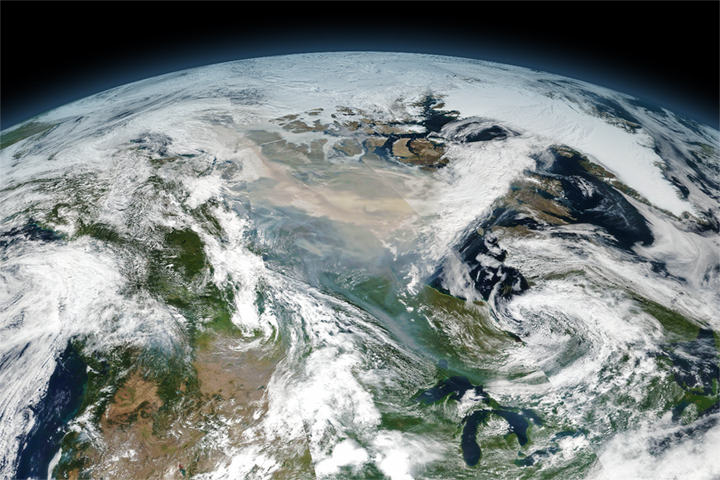 Dense plumes darkened the skies over the Northwest Territories in August. 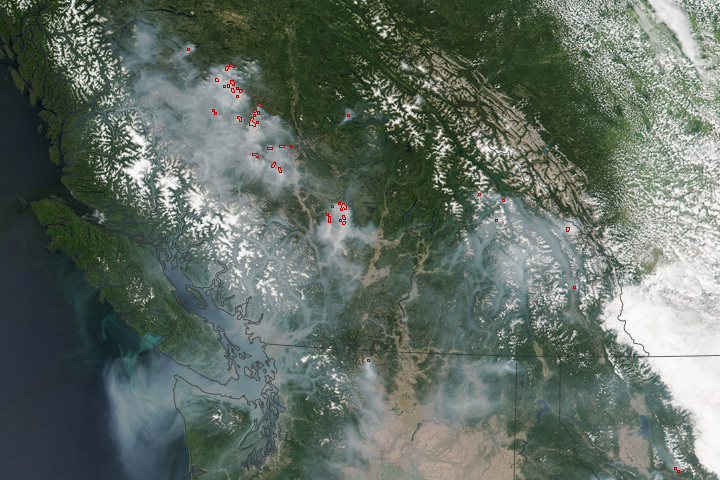 Hot, dry weather fueled a spate of wildfires in British Columbia in 2017 and 2018. CIMSS PyroCb (2017, August 14) PyroCbs in Russia. Accessed August 15, 2017. CBC News (2017, August 13) Wildfire smoke blankets Northwest Territories, prompts special weather statements in several communities. Accessed August 15, 2017. FireSmoke Canada Smoke Forecast. Accessed August 15, 2017. Government of Canada Public Weather Alerts for Canada. Accessed August 15, 2017. 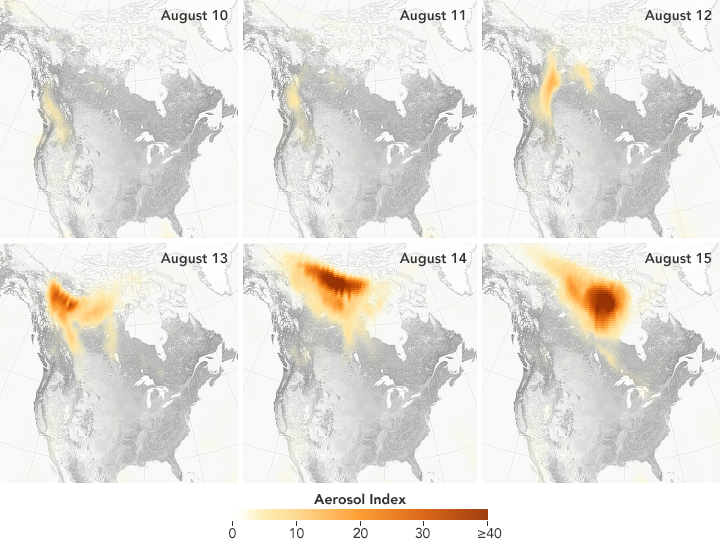 NASA (2017, August 15) Record Breaking Aerosol Index Values Over Canada. Accessed August 15, 2017. Natural Resources Canada (2017, August 15) National Wildland Fire Situation Report. Accessed August 15, 2017. 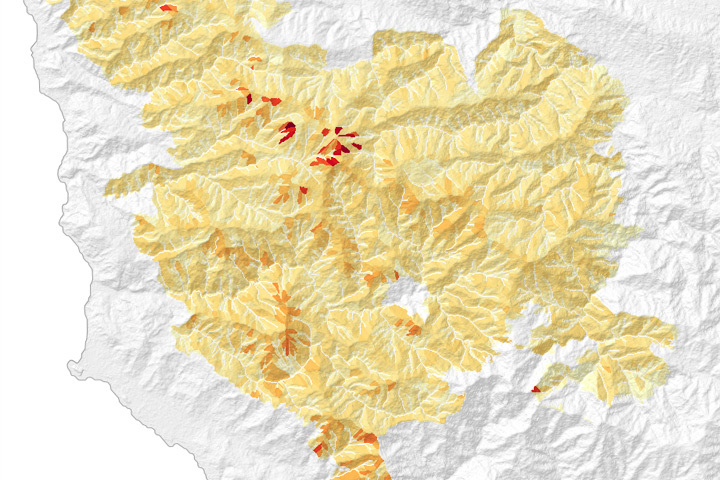 NASA Earth Observatory (2014, August 6) National Wildland Fire Situation Report. New Scientist (2017, August 11) Fighting to breathe in the face of Canada’s wildfire emergency. Accessed August 15, 2017. The Smog Blog (2017, August 13) Intense Smoke from Canada Moves Into US. Accessed August 15, 2017.